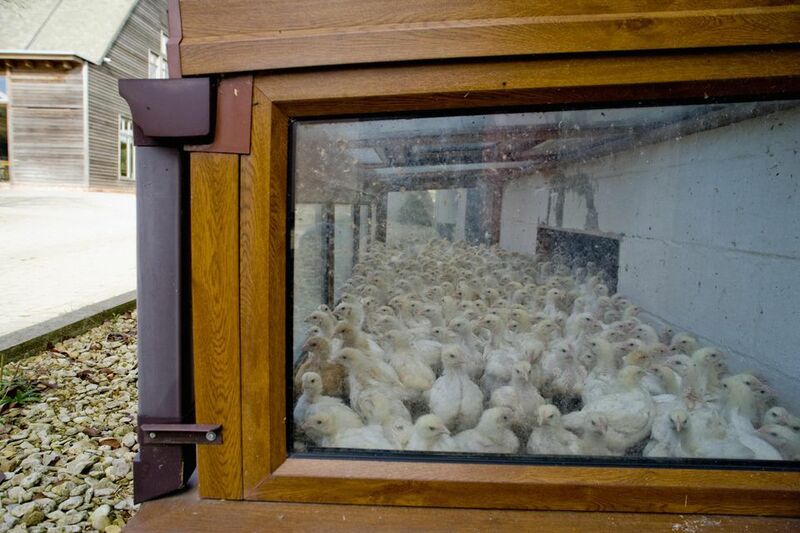 A brooder usually refers to some type of heated enclosure for raising baby poultry, whether they are baby chicks, turkey poults, or goslings. Typically, a brooder includes a heat lamp, a source of food and water for the chicks and bedding such as pine shavings. A screen enclosure on top can be very helpful to keep out curious pets and children. These brooders can also be called mini-coops. Chicken brooders are available pre-built, but you can also make your own chicken brooder. Baby chickens need least one square foot of space per chick. A part of that space is fine for a few weeks so you can move them into a larger space as they grow. That's just the basic rule of thumb, especially if you do not want to transition them int a larger coop. Building your own poultry brooder? Make sure the space is at least 12 inches tall for chicks in weeks one to three. Chicks will need 24 inches of height when they are six weeks old in order to stop them from hopping out. Whatever you use, make sure they get fresh air. So you may want to add a screen that protects them and allows air in the brooder. Place the brooder in a place where the chicks can be warm, dry, and safe. Keep it out of the elements. For bedding, don't use newspaper and stick with pine shavings instead of cedar shavings. Cedar can release oils. You'll want to spread about an inch of bedding on the floor. A heat lamp should go in the brooder on one end of the brooder. If the chicks are in the living room where it’s 65 F, a 100-watt incandescent bulb in a clamp-on utility light with a metal reflector will ensure they are warm enough. If the chicks are in a barn or other cold-weather location, make sure you give them a heat lamp. Play with the spacing of the bulb, as it may need to be a few feet away to keep the space at the optimal temperature. Make sure the heat lamp cannot get the shavings too hot and cause a fire hazard. Speaking of temperature, note that the chicks should stay at about 95°F for their first week. If you get them by mail, they are typically less than 48 hours old. Try to ensure you know how old the chicks are when you bring them home so you can adjust the height of the bulb. Keep a thermometer to constantly measure the bottom of the brooder. Once you know the chicks' ages, you can lower the thermometer by 5°F each week. Make sure they have ample food and water. Use a special starter feed, and make sure it does not get wet -- so you will need to keep the coop clean to prevent mold development. The portable chicken brooder isn't needed after six weeks. That's when the chicks' feathers should be filled out and they can be moved to the regular coop. At that point, they can handle cooler temperatures.